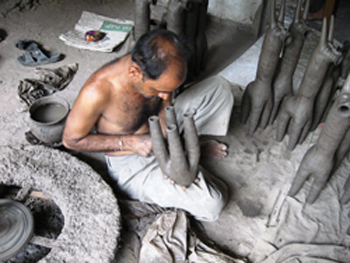 Clay is essential to Indian culture, past and present. It has been the perfect vehicle for Indian creativity throughout the ages. In Gujarat, it is of no exception. In rural Gujarat, especially in the tribal belt of north and eastern Gujarat, votive terracotta objects are offered to a deity that has special significance to the community. Shrines are found throughout the tribal belt in such places as the summit of a hill, amongst the shade of trees or on a river bank – deserted spots that emanate a mythical, spiritual aura. The shrines are filled with hundreds of clay objects placed one against another in a mass of juxtaposed forms. Around the clay figures, the most noteworthy are the terracotta horses. When somebody from a tribal community wants to make an offering of terracotta horses they approach the potter to place an order. From this initial stage until the offering is made at the shrine, rituals are followed to mark every event. The terracotta horses are taken to the shrine along with live chickens, incense, rice, coins, liquor and coconut. Friends and relatives accompany the host. The styles and techniques of terracotta horses vary from area to area, and range in size from two centimetres to one meter tall depending on the quality of clay. In eastern Gujarat, where the clay is not suitable for throwing, the hollows are kept short and wide, where as in North Gujarat, where the clay is excellent for throwing, the hollows are kept long. There are several reasons for offering terracotta horses. Most commonly they are offered at different stages of a crop’s growth, for general wellbeing of an individual or family, for infertility in humans and animals, when cows and buffalos do not give milk and as an offering to ancestors.